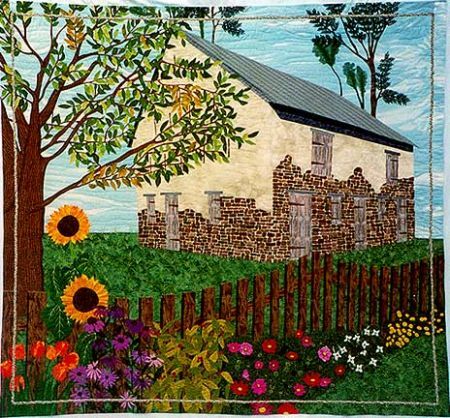 You can almost feel the season drawing to a close in Karen's "Country Time" quilt based on ten photographs she combined to develop "the perfect summer" image she wanted. In front of the barn with its individually appliqued stones, the sunflowers have grown tall and the other flowers are still in full bloom, but the leaves on the trees are just beginning to turn, signaling the beginning of fall. Karen says she "really grew" in developing this quilt. In answer to the question "How do I get the look I want? ", she experimented with painting fabrics for the first time, combining them in the piecing and applique with commercial prints and other hand-dyes. She embellished the design with additional touches of paint and machine embroidery and machine quilted the piece. Country Time appeared as the "Photo Finish" quilt in the October 2002 issue of Quilter's Newsletter Magazine.